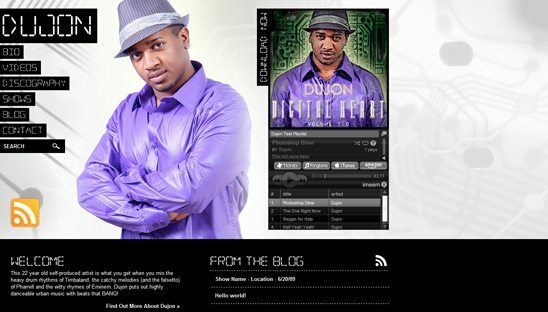 Born into a family of DJs, Dujon began developing his taste for music at an early age. By the 5th grade, he was already messing around with his cousin’s turntables and making mixtapes of his favorite songs. By the time he was 12, Dujon was already well into his musical development. While training his voice in the school choir, the straight-A student began learning to read music and play the keyboard, as well as the clarinet. We built / designed Dujons wordpress site to have a personal feel and not look too much like a blog, even though it uses the wordpress CMS. This site has a video section using a You Tube plug in and it also has the facebook connect plugin as well.